/ Do You Know These 7 Interesting Facts About African Boxwood? 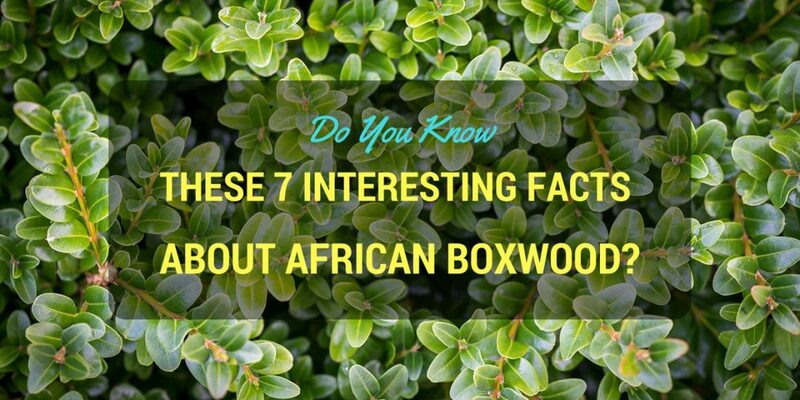 Do You Know These 7 Interesting Facts About African Boxwood? African Boxwood is a resilient little plant that grows easily and works just about anywhere. It’s a plant worth learning about because of its versatility in gardens, parks, and even urban areas. If you’re the kind of person who loves easy plants that never dull or die away, then this is one for you. It’s one of my favorites because of its hardness, its lushness and its low maintenance. There are seven things about African Boxwood that are worth knowing if you plan on getting one of the many varieties available out there. I‘ve put these together for you in a helpful list that’s sure to encourage your interest and make you go out there to investigate about them further. So without further ado, here are some interesting facts about African Boxwood that you simply have to know. One of the reasons African Boxwood is so versatile is because it stays green all year round. This enables you to plant it in places where most plants will die down in winter and/or autumn. It’s a shrub that’s perfect for parks, restaurants, wedding venues, and of course private gardens. Areas that require a certain degree of lushness will do well with evergreen plants such as the African Boxwood plant. While other gardens are recovering from frost or prolonged cold weather, this particular plant holds up as a green shrub that never loses its rich green color. This hardy shrub also holds up against strong winds. Its leaves are anything but vulnerable and the strong internal branches won’t be easily moved. African Boxwood possesses a solid root base too. Combine these characteristics together and you have a durable, green shrub that’s always a beauty to look at. Looking to diversify the look of your garden? That’s possible with African Boxwood because the same species contains over 70 different variations—each one with its own unique characteristics and look. Most of these variations are available at plant parks and nurseries, and you’ll be spoilt for choice when it comes to choosing the ones you want. Being able to diversify a garden area with African Boxwood means you have a hardy, resilient plant with all kinds of different looks to it. If you like options, you could easily have three or four different variations of this shrub in your garden and people would assume that they are completely different plants. What’s wonderful about these shrubs is that they come in various shades of green too. While they will retain their lushness and their color, you as a gardener can diversify the look and feel of each area. Right now you’re reading this article on the internet. That means you could be anywhere in the world right now; and that’s fine. African Boxwood is one of those wonderful plants that aren’t named after the only area they thrive in. Africa has a harsh climate for most of the year. It takes a hardy plant to survive that kind of climate which says a lot about African Boxwood shrubs. These plants can be seen all over Europe, North & South America, Africa, Asia, and even some of the colder parts of the world. Through rough weather, tough climates and dry seasons; African Boxwood still retains its lushness. No wonder it’s one of the most popular shrubs in the world. In addition to its versatility in growing conditions, African Boxwood also requires very little maintenance in terms of watering and nourishing. As with most hardy plants, this shrub will thrive in dry weather because it stores its water for long periods of time. A lot of compost and/or manure will not be rejected by the plant, but in most cases it isn’t really necessary in order to grow them successfully. African Boxwood will maintain itself despite harsh environments, poor soil, and dry conditions. In fact, these conditions won’t even hinder its ability to flower in spring, or bear fruit in summer. Where most people do choose to maintain African Boxwood is in the trimming thereof. Let’s take a look at another fact about this awesome shrub that you may not have been aware of. Most varieties of African Boxwood can be sheared and shaped in extremely creative ways. This shrub is a popular sight at hotels, restaurants, casinos, residential estates, golf courses and public parks. Groundskeepers who are adept at shaping shrubs find the African Boxwood an easy shrub to work on. This shrub is well known for its sturdiness. It has many branches inside of itself which support the shape of the plant. Shaping it is effortless and it will always take on that shape as it regenerates its foliage around itself. Shearing the African Boxwood with indentations won’t make it look bear or as if it has a hole in it. Even some of the most experienced gardeners don’t know about this little jewel of information. African Boxwood is a ferocious attraction for bees, butterflies, and other pollinating insects. Planting one or two close to—or around—your vegetable garden will attract a lot of beneficial insects to your garden. This is especially true during spring and summer. Spring time sees the African Boxwood flowering with light green flowers which bees and butterflies adore. In summer, the shrub will bear fruit. Not only will this fruit distract birds from your veggies, but it’ll also continue to bring beneficial insect life to your garden. African Boxwood is an often overlooked complimentary shrub to any veggie garden. In many ways, it’s the vegetable gardener’s companion because it encourages the natural ecosystem of your garden. If you love vegetable gardening, then get at least one of these awesome shrubs today. The branches of African Boxwood are even more versatile than the plant itself. This is an incredibly durable wood that has many uses—and you’re about to learn some of them. Perhaps the most popular use for African Boxwood wood is that of whittling. The branches aren’t very thick, but they are large enough to carve out trinkets such as key chains, chess pieces, and small keepsakes. Archers who enjoy making their own arrows will find African Boxwood as the perfect wood for that purpose too. The wood also contains essential oils which can be extracted and used to treat wounds, arthritis, fever, toothache, stomach pain, and even epilepsy. Moreover, if enough of the oil is extracted, it can be used for its extremely potent calming effects (to the point of being a natural sedative). Now you know more about African Boxwood than you did before. As you can see, it’s a plant that everyone should have around them. Not only is it highly beneficial in various ways, but it’s great to look at too. So spruce up your immediate area with an African Boxwood or two and enjoy the year-round lushness this beautiful shrub offers.